We give everyone trying to market their professional services businesses the same essential message. The key to success in marketing a personal service and attracting new clients is making direct, in-person contact with the people who need you … lots of them. You can accomplish this in three ways … speaking to groups, which is the most powerful strategy by far … forming strategic alliances with referral partners … and networking with your target market. You should spend 80% of your time focused on one or two of these “high-touch” strategies. That’s a message we repeat over and over again, because that’s what pays off in direct results more quickly and bountifully than any other approach. But why? Why does it pay off? We usually give a short-hand explanation. Because it gives people a real life, person-to-person experience of you. And people typically buy from people they’ve come to know, like, and trust … people they believe can help them solve their problems and take care of their needs. Okay, but why should being in your personal presence have an effect that’s so much more powerful than, say, a digital communication? Because the digital communication is disembodied. That matters, because everything in this universe comes down to vibration. Vibration matters. That may sound somewhat esoteric, but relate it to a common experience. It’s much harder to pick up someone’s vibe and resonate with it when it’s filtered through words on a page. 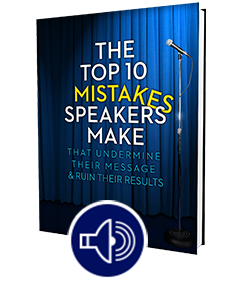 Think of all the emails you’ve gotten where you had a hard time picking up the exact tone and nuances of the message, because you couldn’t hear or see the person. The words alone were unable to reveal the person’s mindset to you … their feelings. When someone is talking with you, interacting with you, the sound waves produced by the voice are vibrations that stimulate a physical reaction in the listener’s ear. It’s a physical event. You might say, “So what?” Well, this is how our ancestors have been communicating since the beginning of human time. It was only with the invention of the printing press back in 1440 … less than 600 years ago … that 99.9% of the population even had the option of communicating in writing. We are wired to respond to the sound of someone’s words and their vocal non-verbals. How someone sounds reveals a lot about what’s going on in that person’s head … and heart … and gut. Only the very best writers can come close to achieving the same impact with the written word. The written word is great. It’s a wonderful tool, but it has a hard time pulling the same weight when it comes to moving, touching, and inspiring people the same way your speaking does. And it’s not just the sound of your voice. It’s the look in your eye. It’s how you look at the people you’re talking to. It’s the way you carry yourself … how you move. That visual impression is the result of the brain processing images constructed from light waves … physical vibrations landing on the retina of the viewer. The vibrational connection is direct and immediate. It makes your communication personal … intimate. And it’s those signals you’re sending, verbally and non-verbally, that move people to conclude they like you, they trust you, and you might be able to help them. Do a good job of connecting with your audience and presenting what you can do for them and they’ll be far more likely to do business with you than if they never see you and interact with you. Because they’ll feel as if they really know you. Good luck getting the same result from an online profile, for example. Now, you’d be dumb not to also post your profile online. It’s a useful tool. Just don’t expect it to take the place of that up-close-and-personal experience of you. And don’t spend too much of your time pursuing low and medium touch strategies … the disembodied ones. This is a primal thing. This is about how we respond as biological beings to physical vibration … to the essence of someone in our presence. And when you appear in the world with a powerful presence, you attract people to you.